This week's attack against four American civilian contractors, who were killed in the Iraqi city of Fallujah, has highlighted the difficult and dangerous work of hundreds of civilians in Iraq. Many of them are volunteers, who have gone there to help rebuild the country. VOA's Greg Flakus in Houston spoke with the family and friends of one young woman from the American heartland, who was killed last month, and whose commitment and courage continue to inspire those who knew her. On March 9, one day after the Iraqi provisional constitution she helped shape was approved, 33-year-old attorney and human rights activist Fern Holland's life ended in a hail of automatic rifle fire. The ambush on a road near the Iraqi town of Karbala also claimed the lives of a fellow worker from the United States, Robert Zangas, and an Iraqi, Fern's close friend and interpreter, Salwa Ali. Fern Holland's loss was mourned by the hundreds of men and women she had worked with in Iraq. Her death also brought sadness to people in the African nations of Namibia, where she served as a Peace Corps volunteer a few years ago, and Guinea, where she worked with refugees. Anita Sharma of the Woodrow Wilson Center in Washington also worked in Iraq last year and kept contact with Fern Holland and other civilian workers by email after she returned home. She says Fern Holland may have been killed by people in Iraq opposed to the women's rights provisions she helped write into the provisional Iraqi constitution. "She was pretty brash, she was outspoken," said Anita Sharma. "She was committed to forwarding the women's agenda and the speculation is that, perhaps, she was specifically targeted because of her work on the constitution." At the time of her death, Fern Holland was working with the Coalition Provisional Authority on legal matters and women's issues. There are hundreds of civilians like her still working in Iraq, some with the coalition and many others with non-governmental organizations. 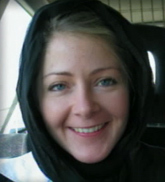 Anita Sharma says the murder of Fern Holland and other civilian volunteers in Iraq complicates the already difficult task of helping Iraqis build a better nation. "You have that emotion tied to it, wanting to help them because they are helping themselves, and wanting it to succeed, but, at the same time, having a sinking feeling that it is going to get much more difficult before it gets better," she said. Many other international civilian volunteers and many Iraqis who worked with Fern Holland remain inspired by her enthusiasm and struggle to carry on her work in spite of the danger. In her home state of Oklahoma, Fern Holland is remembered by family members and friends as a humanitarian hero. They say she chose to study law because she wanted to help people in trouble. Jim Green, a friend and attorney who worked with her at a Tulsa law firm for more than a year, says Fern Holland was a rising star who could have had a lucrative career after graduating from law school with honors and working for four years at law firms in Tulsa. "But she did that, I think, to get the basic experience as a practitioner, because she wanted to use her legal skills to work for human rights internationally," said Jim Green. Mr. Green says Fern Holland was not motivated by any unrealistic vision of solving all the world's problems. He says she was practical, hardworking and well aware of the risks in Iraq. "She appreciated the danger, and I certainly raised that issue with her, but for someone who is a human rights worker internationally, and she is not the only one who views it this way - I have talked to many others since Fern's death - these people are dedicated," he said. "The best and the brightest in that field see this as an opportunity in Iraq to make a difference in the world." Fern Holland's eldest sister, Mary Ann Dunn says she is still trying to come to terms with the loss, but that she and her family believe in what Fern was trying to accomplish in Iraq. "I got a phone call yesterday from someone in Baghdad, saying that they are trying to carry on and keep up the work," she said. "I have received e-mails from people from Iraq who are so lost because she is gone, and they loved her so much. She was just so courageous, trying to instill that in them. Your heart just has to go out to those kind of people who are in such turmoil." Fern Holland's family and friends take comfort in knowing that her legacy lives on in the hearts and minds of the people she worked with in Africa and Iraq.